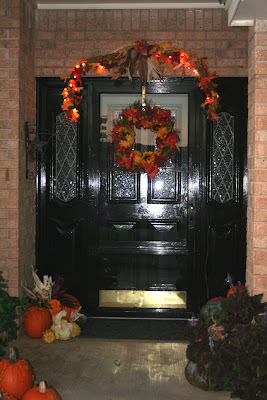 Melissa over at the Inspired Room is having a Fall Porch tour. 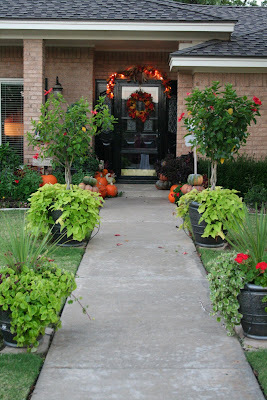 I love looking at front porches, especially in the fall! I not only love her name, but Melissa's got a great site dedicated to home. 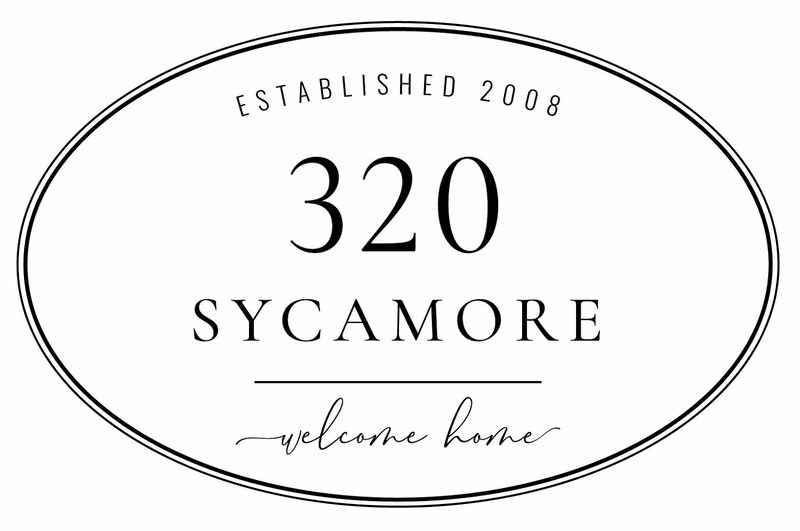 From her site: a happy mix of realistic interior design, simple homemaking and inspiration for authentic living. So, here are some I took out on my yard sale adventures. I have no idea who lives in these and I was getting some very strange looks from the gardeners and workers around the neighborhood, so I just snapped a few and ran! 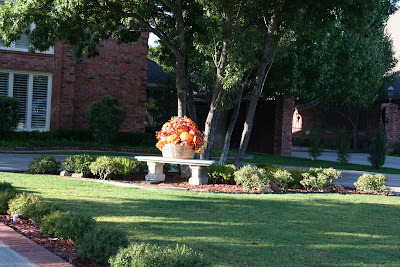 I loved this basket of fall foliage just sitting on a bench.. This is my friend and neighbor Alison's. 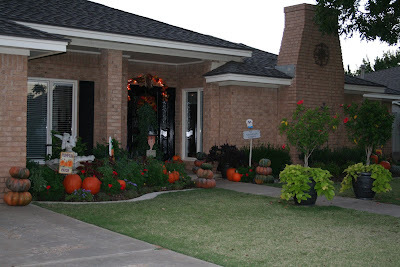 Her yard always looks immaculate as well and she's got great taste~I especially love her wreath! Sorry the pics aren't the greatest~it's getting dark so much earlier now! Y'all have fun touring~thanks for stopping by! Hi, other Melissa! :-) You found some gorgeous doors and decor! That first house was a real mansion! And I loved that white one with the porch too. Your friend's yard is lovely too...she is really talented! Now those are beautiful porches! LOL about getting looks from gardeners. I would be too afraid of having the cops called because a weird looking petite woman is taking pictures of from porches! LOL Great picture taking! Those are some amazing mansions you've got around there. But you know what? I actually like your friends' homes better. They're more down-to-earth, more cozy. And, really, more welcoming. Wow - that first house was huge - I've never seen anything like it! Beautiful porches. 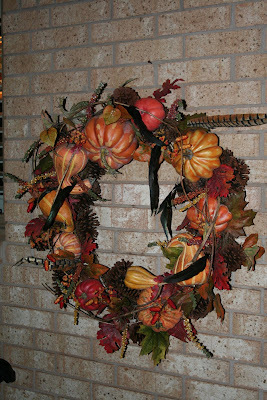 I love love love wreaths! Oh southern plantations - how I love thee. Awesome pictures :) Why were your cute porch pictures not in this post?! 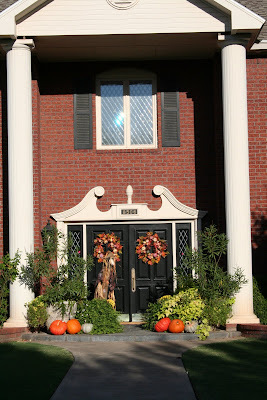 What a fun tour of fall porches! No wonder you find such great deals and items when you go yard-saleing! You are in fantastic neighborhoods! 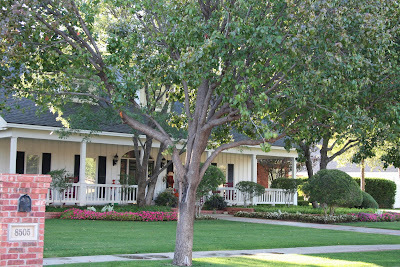 I loved the yard that belonged to your friend...the one with the potted trees along the path to the front porch...that girl has a green thumb! Thanks for sharing the fun pics. I love fall! Have a great day! I so love your blog and great ideas! oh my goodness Melissa!! What a great idea! 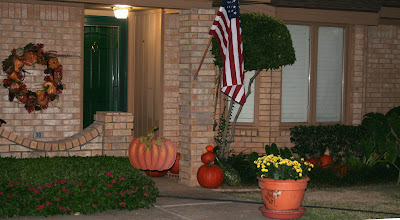 I was just telling a friend that I love to drive around and look at peoples fall decorations!! I might have to copy you!! 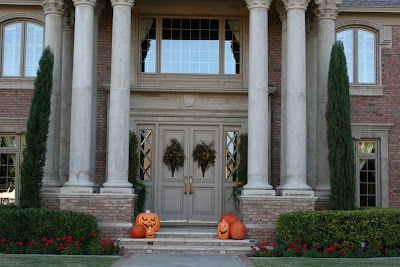 What pretty front porches you found and I love the decorations! Some of them were quite huge! Okay Melissa...I LOVE your new blog!!! You are my MARTHA:) Thanks for all the cute porch ideas. 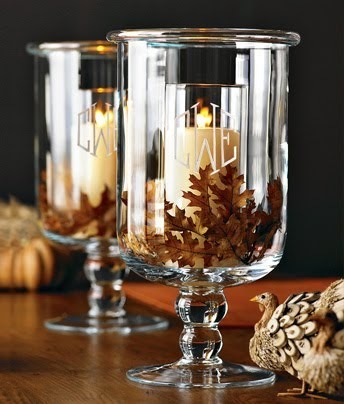 First thing on my list for tomorrow is to spruce up my porch for fall. 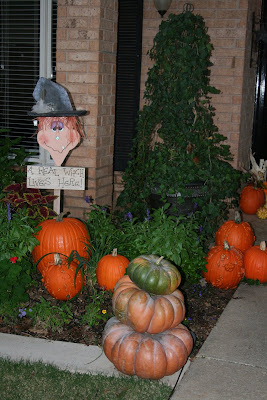 My pumpkins sitting sweetly on my steps just won't cut it:) Thanks for the inspiration! Can I just tell you, I love your blog. The look and feel, the pictures, the music. It was an absolute pleasure to stop by. oh my goodness, those are some gorgeous houses and front doors.....i don't care for the creepy, but the others are so lovely! Wow those are some beautiful houses. 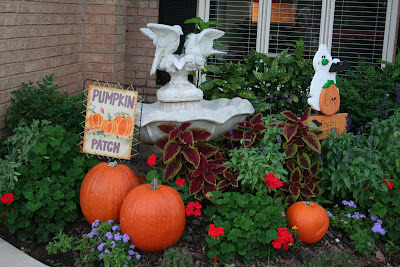 I love seeing how everyone decorates for different holidays. Hey, do your remember what template you used or where your got it to create your blog? I redid my sisters my I like the column width better on yours. I really have to put out some fall decorations on my porch. I just found your blog. How beautiful! I love it! I love the porches! They are my weakness. 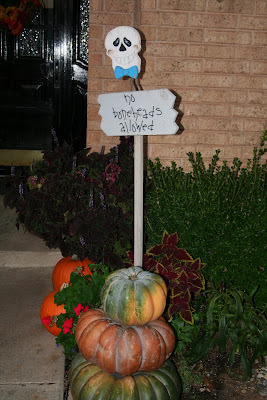 Enjoyed reading your Fall Porch post. I also got some strange looks when I was photographing the houses. In fsct, the police rode by one time. i thought they were going to stop and talk to me but they didn't.